Engineering fabrics can be used to provide a roofing material which offers unique properties to the designer. They can be translucent or blackout, single or double skinned for insulation, and are resistant to ultraviolet light degradation over periods of many years, sometimes longer than a traditional roofing material. Engineered roof fabrics can be self coloured or have a range of translucencies yet retain those properties over the service life of the structure, often 15 to 20 years. All materials specified by Rudi Enos Design will have guarantees of a minimum of five years with extended warranties available on all permanently installed structures. With the advance of many new materials such as 100% PTFE fabrics and ETFE 'bubble' fabric, the choices for the engineer and the fabricator are even better than before. 30 and 40 year life spans can now be looked froward to. Most engineering fabrics use a base of high tenacity polyester or glass fibre with a high modulus to minimise extension under load. Both exhibit high tensile strength to weight ratios with resistance to tears and high shear strengths. Yarn stability is unaffected by changes in temperature and humidity which provides the dimensional stability that mechanically tensioned structures require. Specially formulated coatings provide extended performance characteristics for specific installations such as arctic or desert conditions. As well as resistance to chemical attack and the retention of flexibility in cold weather, the roof materials can be repaired in situ for economical maintainance. 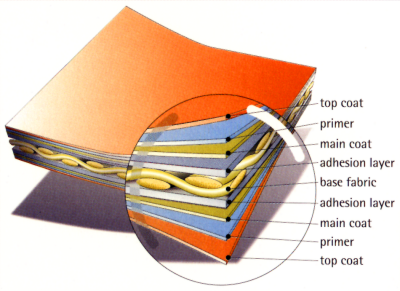 Engineering fabrics have been extensively tested over a period of many years and meet building codes around the world. We have test results for flame resistance, colour fastness, fade resistance, flexibility and elongation under load.